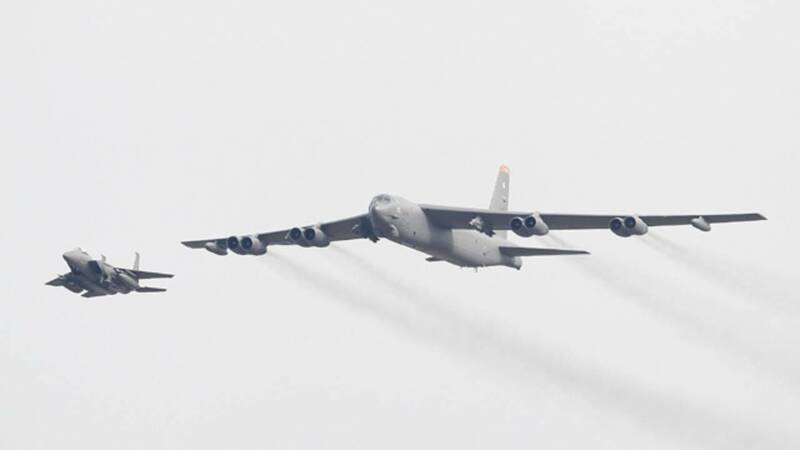 WASHINGTON (CNN) - The US Air Force has deployed six nuclear-capable B-52 Stratofortress bombers to Guam, according to US Pacific Air Forces, adding more firepower to the region just hours after North Korean state media mocked President Donald Trump's tweet referencing the size of his nuclear button as the "spasm of a lunatic." Officially, the deployment is part of the US military's effort to maintain a "continuous bomber presence" in the Pacific, but the timing coincides with ongoing talks between North and South Korea ahead of next month's Winter Olympics. The talks mark the most significant thaw in relations between the neighboring states in years, and the US remains cautiously optimistic that the dialogue could eventually provide fertile ground for diplomacy. Washington and Seoul opted to postpone their annual military exercises until after the Olympics, but the Air Force said it will maintain "routine" fire power in the region even as talks are ongoing. Ongoing discussions between North and South Korea has not prevented Pyongyang from openly criticizing the US and President Donald Trump in recent days. The B-52s and 300 airmen from Barksdale Air Force Base will replace the B-1 bombers currently stationed in Guam and join three B-2 stealth bombers that arrived at Andersen Air Force Base earlier this month. While the B-1 Lancers are scheduled to return to their home base at Ellsworth Air Force Base in South Dakota at the end of the month, the Air Force said that the three types of US bombers will overlap in Guam for a few days. The highly versatile, supersonic B-1 is considered the backbone of the US long-range bomber fleet and carries the largest conventional payload of any aircraft in the US Air Force. Earlier this month, the military boosted its stealth attack options in the Pacific when the amphibious assault ship USS Wasp moved into the 7th Fleet area of operations. Meanwhile, more than 6,000 sailors assigned to the Carl Vinson Strike Group left San Diego earlier this month for a regularly scheduled deployment to the Western Pacific, according to the US Navy. Led by the 97,000-ton aircraft carrier USS Carl Vinson, the strike group includes a guided-missile cruiser and two destroyers in addition to the accompanying air wing.